in the owner's suite of the Norwegian Sky cruise ship. Our 42nd cruise was a 4-day cruise out of Miami on one of Norwegian Cruise Line's older ships... not the kind of cruise that I usually do, as I tend to prefer to sail on the newest ships in a cruise line's fleet, and like to take as long of a cruise as possible. But there were some special things about this cruise that made it irresistible to me! 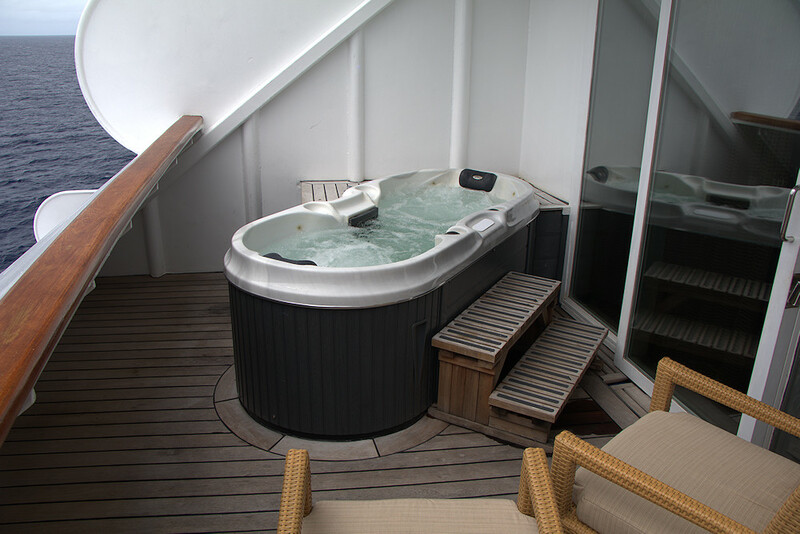 The #1 thing that made me book a cruise on the Norwegian Sky was the fact that if you booked the owner's suite, you would have your own private Jacuzzi out on the balcony. When my wife and I are on vacation, we just love to spend as much time in a Jacuzzi as possible. At our home in California, under extreme water rationing due to drought, we will never be able to have a Jacuzzi or a swimming pool of our own. 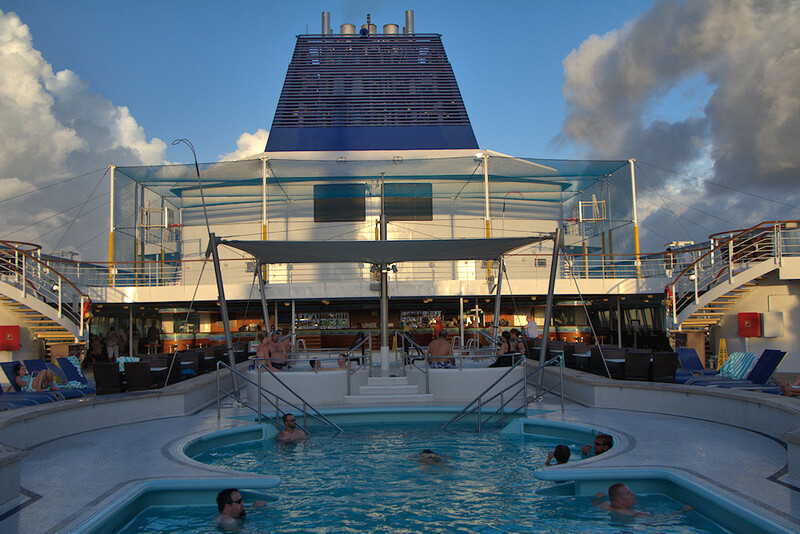 When we're on a cruise, it's a real treat to spend a lot of time in the water. Earlier this year, our 39th cruise was on the Norwegian Pearl... and it was the first time we had ever stayed in the owner's suite of a ship or a hotel. It was an amazing experience, and absolutely the best cruise experience of all we've ever had. But it was a pricey splurge at about $1800 per night... and ever since then, I've been looking for ways to get that same kind of experience at a more affordable price. Someone suggested I check out the Norwegian Sky, since it offered an only slightly less extravagant owner's suite at a significantly lower price. It was a fantastic suggestion! 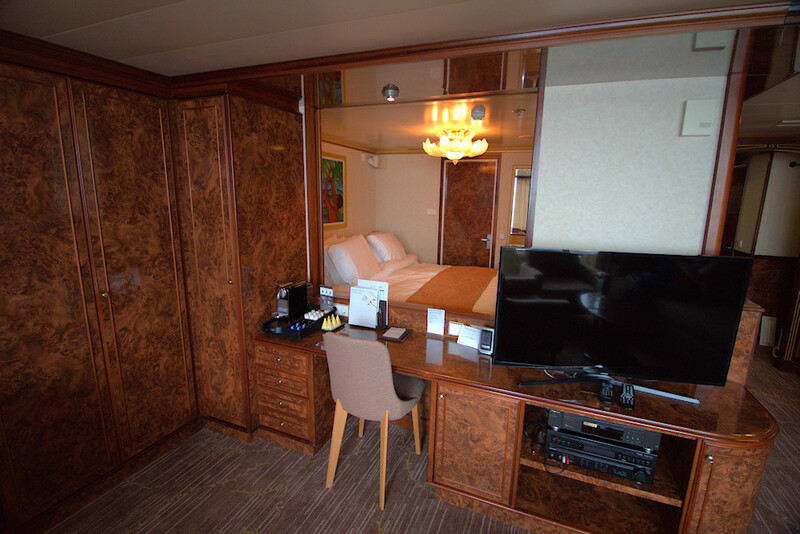 Four days in the owner's suite on the Norwegian Sky set us back slightly more than $4000. With each passing year, I was making a little more money and the kids were costing us a little less. So, over time, our vacation budgets slowly increased. In 2010, we stayed in a suite for the first time. In 2011, we were able to afford to fly to Miami for the first time and do a Caribbean cruise. We started to do a lot of back-to-back cruises. In 2013, thanks to the profits from my first viral YouTube video, we were able to splurge on the most expensive suite on the Carnival Sunshine, the Captain's Suite. In 2014, with ad revenue from YouTube getting even stronger, we were actually able to do six cruises in a single year... including our first experience with luxury cruising in The Haven on Norwegian cruise line! The living room of the suite is extremely large for a cruise ship, and features a comfortable couch and two chairs... as well as additional seating at the bar, and at the dining table that I'll show you in a moment. In this photo you can also see the entertainment center... which features a television, DVD player (not a blu-ray player), an audio amplifier for the sound system, and speakers in both the living room and the bedroom. On vacation, I always have a little bag of electronic goodies with me... things I may or may not need, but are good to have, just in case. One of the items in my electronics bag is an adapter cable to connect something with a mini-headphone jack up to something with left/right RCA inputs. This really came in handy in the owner's suite, because it allowed me to plug my MP3 player in to that big audio amplifier... and for our entire stay in the owner's suite, we had all my favorite music playing softly in the background. You can barely see the red & white adapter cord plugged in to the lower left corner of that audio amplifier, allowing hookup of any audio device (such as a cell phone or MP3 player) that has a mini-headphone jack. This adapter cord is NOT supplied by NCL... I had it in my electronic goodie bag. If you like listening to music and you're going to be staying in one of the owner's suites, you might want to buy one of those cables. Notice the artwork on the wall: a Hawaiian girl playing a ukulele at the beach, with an outrigger canoe in the water. 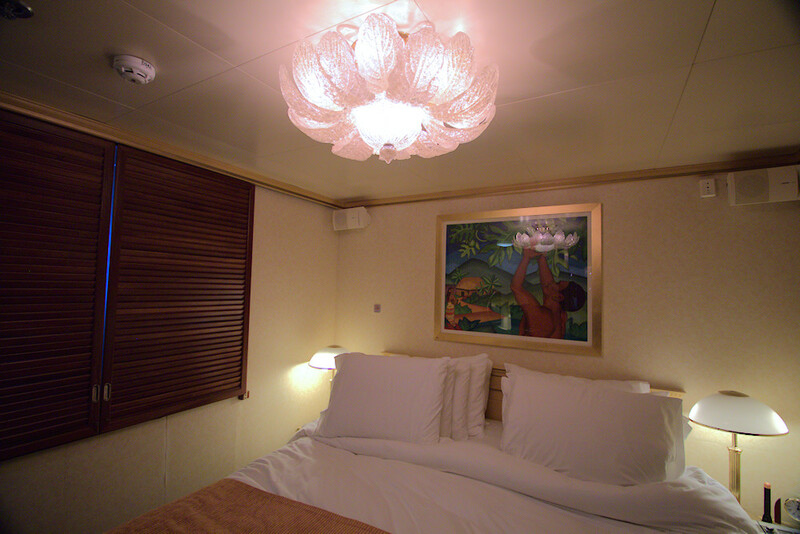 In fact, as you walk around the Norwegian Sky, you'll notice that a great deal of the artwork onboard has a Hawaiian theme. There's an interesting reason for this! From 2004 to 2008, she was not the Norwegian Sky... she was the Pride Of Aloha! NCL did an interesting experiment during those years, positioning two cruise ships in Hawaii and staffing them with a mostly American crew. 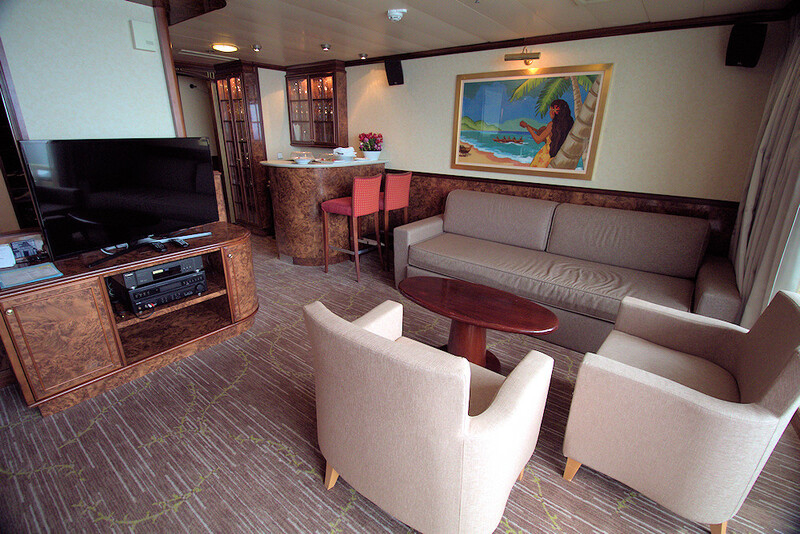 After four years, NCL determined that there was not enough demand for Hawaii cruises to support two cruise ships, and the Pride Of Aloha became the Norwegian Sky again... which is what she was originally when constructed in 1999. The ship really has an interesting history, which you can read about on the Norwegian Sky Wikipedia page. When you first arrive in the owner's suite, you'll find a bottle of champagne on ice for you... as well as three bottles of your favorite liquor. Before the cruise, NCL sends an email to the folks who have booked one of the owner's suites... asking for their preferences on a list of items, including soft drinks and liquor. 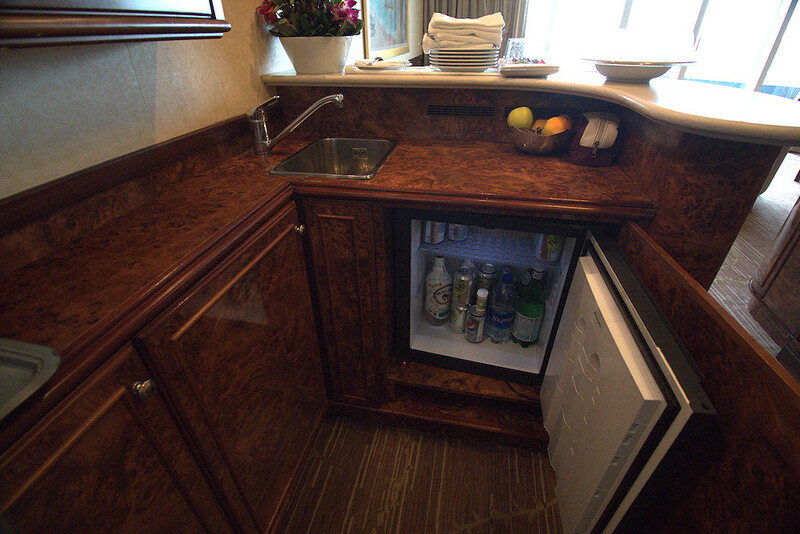 You'll find the refrigerator and the cabinets stocked with your favorites. 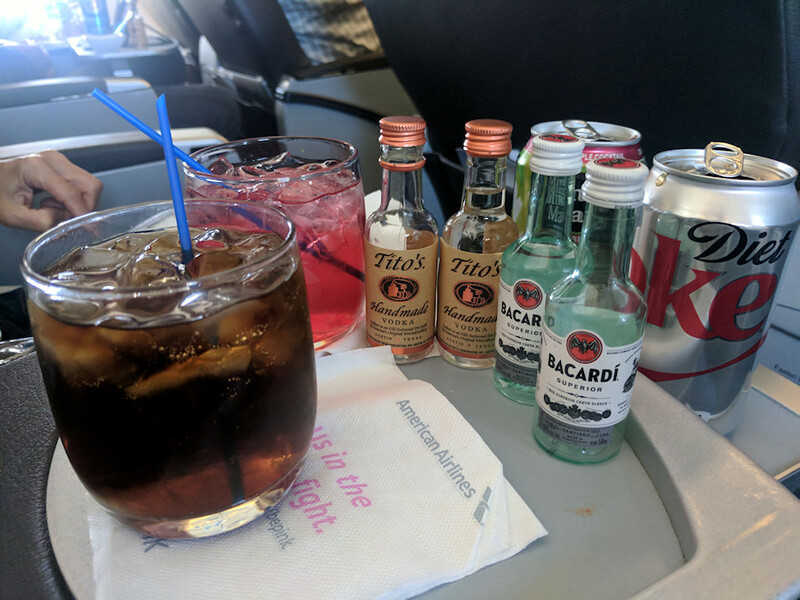 In our case, I had specified Diet Pepsi and Malibu Rum as our drinks of choice, and there were three bottles of Malibu rum waiting for us when we arrived in the cabin! It was only a four day cruise, so two of those bottles were still full by the end. Our butler said we were welcome to take the two full bottles home with us, but I elected to leave them behind out of an abundance of caution in avoiding having a bottle of rum leak on to the contents of my suitcase during the flight home. I hope the crew got to steal my leftover rum at the end of the cruise! In addition to the Diet Pepsi and Malibu Rum I had requested, there was also bottled water and sparkling water and an assortment of other Pepsi products in the cabinet to the left of the refrigerator. On our January cruise in the owner's suite on the Norwegian Pearl, the butler provided a huge chest full of ice for us. There wasn't any ice in our cabin when we arrived on the Norwegian Sky, but the butler came by immediately after our arrival and I asked him if he might be able to provide us a large chest of ice, as had been done on the Pearl. Within a few minutes, it was done. 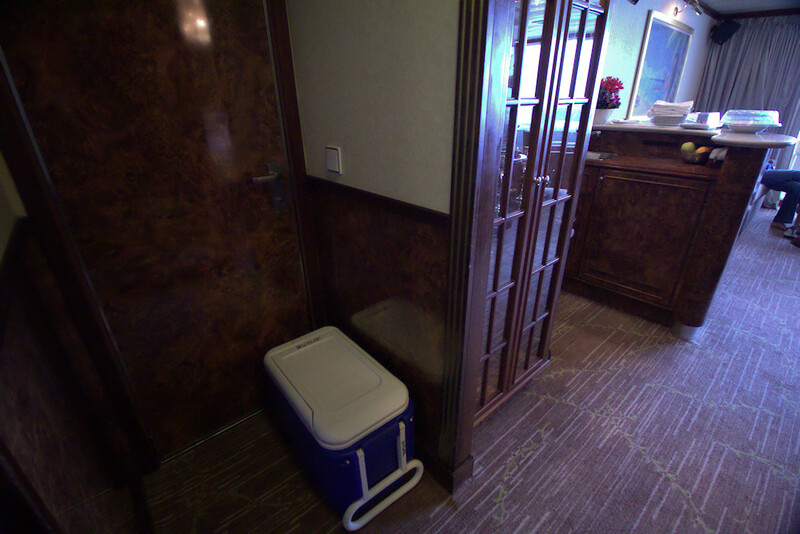 Notice the doorway that the ice chest is sitting next to. It made a good storage location for the ice chest because we didn't use that particular doorway during our stay in the owner's suite. It's a doorway that connects directly to the cabin next door. A lot of people who stay in the owner's suite are cruising with a large group of family or friends... and they use the owner's suite as "party central" and have additional people in the room next door. 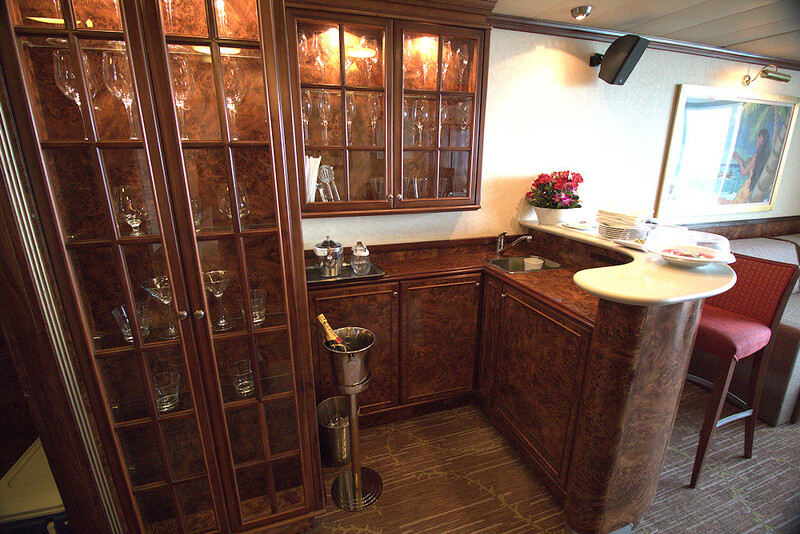 It was just the two of us on our cruise, but I could see how the owner's suite would be a great spot for entertaining! There might be enough beds for as many as six people in the owner's suite... I think the couch was actually a sleeper sofa, and in the next photo there was a 'Murphy Bed" behind those cabinet doors. Normally, there are four chairs at that table, but I pointed out a problem with one of them and our butler took it away for repairs. It's really great to have that table in the room, because you can actually have the butler serve meals there. For example, if you're not a morning person... just request that breakfast be served to you in the suite. That door you see on the other side of the bed leads to the master bathroom. Again, note the Hawaiian art work on the wall! The bed was extremely comfortable, and we slept very well. There were no sources of noise, other than a guy on the other side of the wall that snored really loudly at night! His wife needs to talk to him about getting a CPAP machine. Speaking of which... there were no available electrical outlets by the bed for plugging in a cell phone or a CPAP machine. However, there was a power strip at the bedroom desk, which is not visible in these photos. A short extension cord is needed if you plan to use a CPAP machine at the bed. Here's a look at the bedroom with the shutters closed, to give a nice cozy feeling to the room... and also makes it a little easier to sleep past sunrise. Notice the stereo speakers on the wall. I really liked that you could play music on both the living room speakers and the bedroom speakers at the same time. It just filled the entire suite with music, which I enjoyed (softly, in the background). As a music lover, it really made the room come alive. Of course, the trick to making something like that work is to have a good selection of music on your phone or MP3 player. I have my music library arranged in different folders, based on the mood. Fun, party music like Kenny Chesney's "No Shirt, No Shoes, No Problem" is perfect for daytime and when we're hanging out in the Jacuzzi. After breakfast, or just before bedtime, we keep it pretty mellow with songs like James Taylor's "Fire And Rain", Taylor Swift's "Begin Again", or maybe even some Yanni. Can you tell that at one point in my life, I was the Program Director of a radio station? There's a desk in the bedroom, and I think it might be some kind of Hawaiian furniture style. Personally, I thought it was the ugliest piece of furniture I've ever seen... and the first thing I'd replace the next time they do a refurbishment of the ship. It made a very good spot for my wife to do her hair and makeup, though! It also featured a six-outlet power strip, so it was a good place to recharge electronic items at night. Next, let's take a peek in to the master bathroom... one of two bathrooms in the owner's suite! 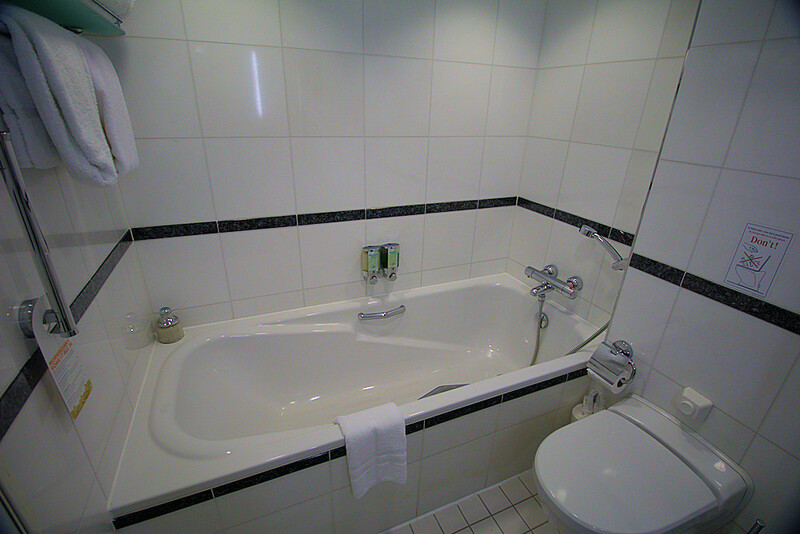 It features a full bath tub, as well as a separate shower. Even with a wide angle lens, there was no way to get a picture that showed the overall bathroom... so we'll look at it in sections. My only complaint about the bathroom is that they made the common mistake of putting the toilet paper roll behind you. That's awkward to reach. But in this particular bathroom, there really was no better place to put it... so that's the way it is. 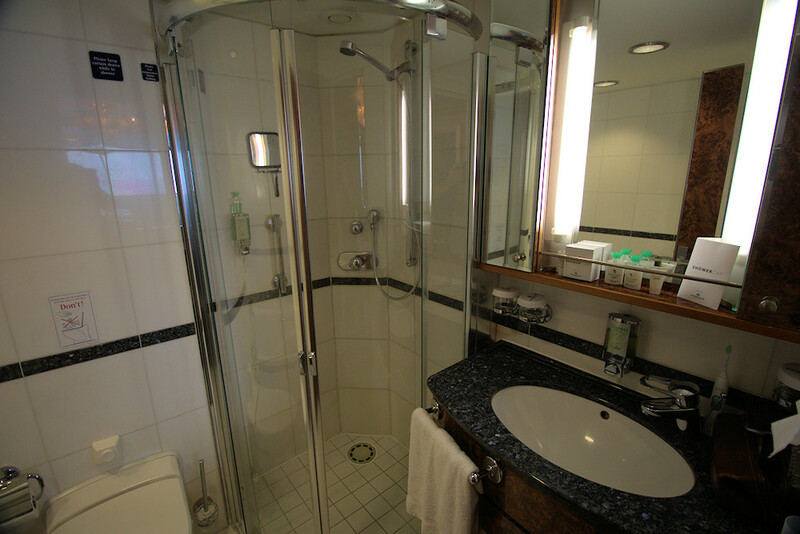 Other than that one minor issue, it's a nice bathroom... and certainly a hundred times nicer than your average bathroom in a cruise ship cabin! The shower was an adequate size for one person, but not large enough for two people to share. 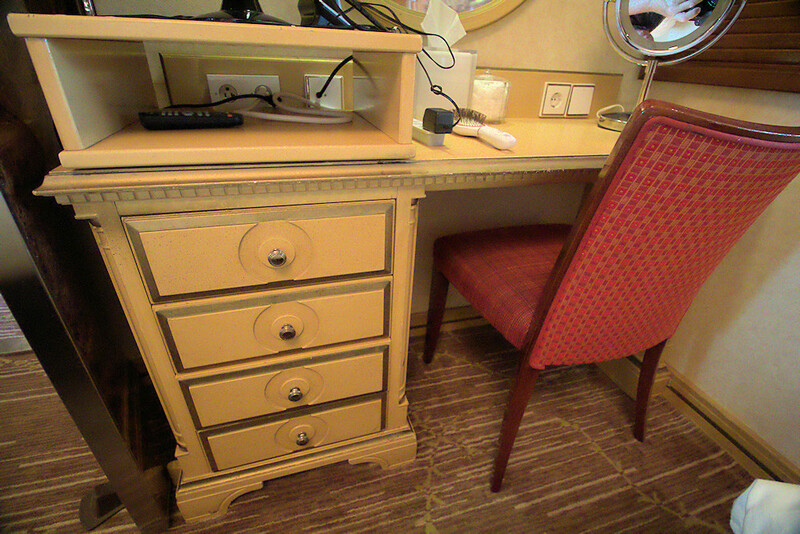 One thing to notice in the photo is the little shaving mirror that I bring along with me on cruises. It makes shaving in the shower very easy! It attaches to the wall with rubber suction cups. I bought it at WalMart for somewhere around $5. They supply a nice selection of products such as shampoo, conditioner, body lotion, liquid soap, and even a shower cap... so there's no need to bring any of that along with you unless you're extending your vacation with a pre-cruise or post-cruise hotel stay. The second bathroom is located near the front door of the cabin, and just features a toilet and sink. I think the intent, especially considering that this suite is "party central" for some large groups of family and friends, is that this is a bathroom your guests can use after they've been drinking your booze! 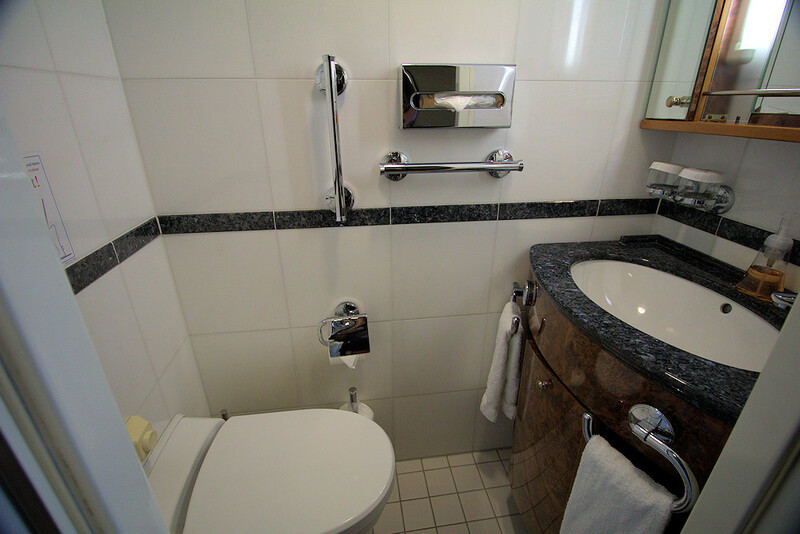 I really liked having two bathrooms in our suite, and there were several times when my wife was using the main bathroom and it was super-convenient for me to use the 2nd bathroom instead of having to wait or share. I'm sure for a lot of people, the attraction to the owner's suite is its large size and ability to accommodate up to six people. That part didn't matter to us... it was just the two of us... but for us, the main reason for staying in the most expensive suite on the ship was to have our own private Jacuzzi on the patio. 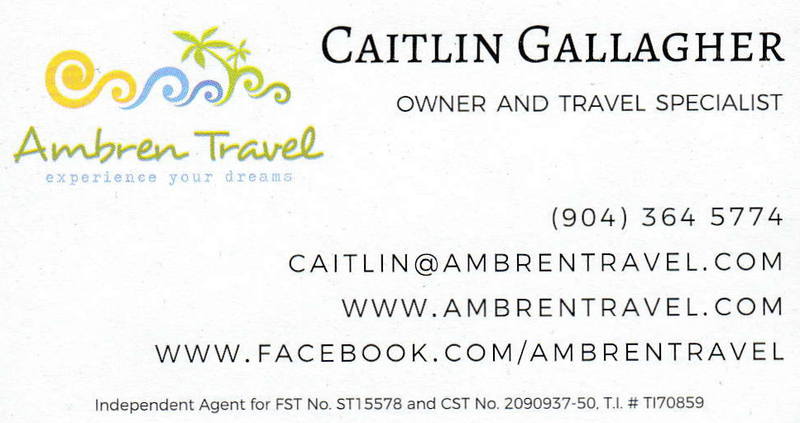 A few days before the cruise, I got a voice mail from my travel agent. His message said he had been contacted by NCL and given some bad news: that the Jacuzzi in the suite we had booked had a serious problem, was not functional, and would be out of operation during our entire cruise. NCL wanted to offer us a $250 onboard credit as an apology for the inconvenience. He wanted to know if I wanted him to accept the offer. This was hugely bad news for us, as that Jacuzzi on the balcony was the whole reason we had booked a cruise on the Norwegian Sky at all. Quite simply, if not for the Jacuzzi, I never would have booked this cruise. Considering that we had paid a little more than $4000 for the cruise... and that, for us, the cruise was all about the Jacuzzi... $250 simply was not going to cut it. So, I didn't call my travel agent back, because I figured I would be in a better position to negotiate something in person once I was onboard the ship. I'm a pretty good negotiator... but those things are best done when you can look someone right in the eye, shake their hand, and make them like you. Once we got onboard, I couldn't wait to speak to our butler about the Jacuzzi. I wanted to find out from him if there was any kind of workaround for the Jacuzzi problem. Could it be filled up at all? Is the problem simply with the pump that runs the filter and makes the bubbles? I could certainly live without the pump for four days, if I could just fill the Jacuzzi up in the morning and drain it each evening. But the butler explained that for reasons of electrical safety, they simply could not let anyone use the Jacuzzi at all until the repairs were made. No workaround. This was disappointing to hear. The butler told me that the concierge was going to be stopping by to talk to me about the situation, and I knew that this meant it was the concierge I would have to negotiate with. Before long, the concierge did stop by to talk with me about it. We went over the situation, and then he mentioned that they would like to offer onboard credit of $250 to compensate. I explained that the Jacuzzi was the entire reason that we had spent over $4000 on the suite, and that $250 simply wasn't going to cut it. 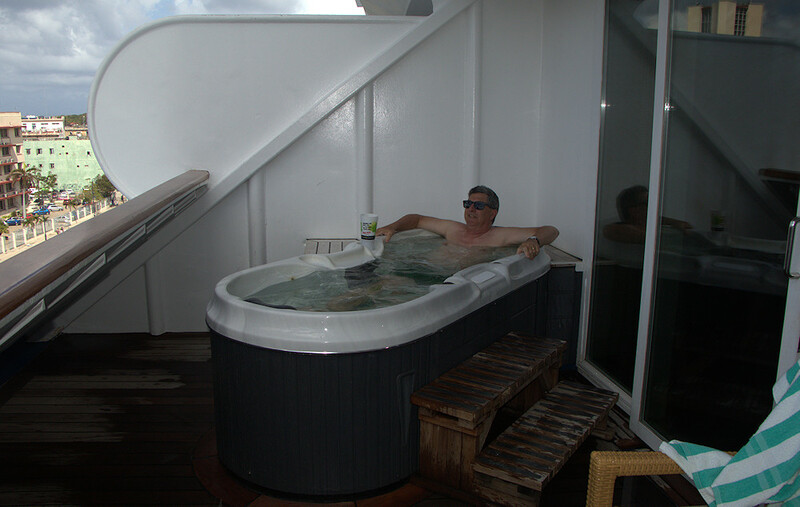 In my mind, I had resigned myself to the fact that we were not going to have a Jacuzzi on this cruise, that we would have to roll with the punches and make the best of it, and all I could do was try to negotiate the largest possible onboard credit to salvage the situation. The concierge said he understood what I had told him about the importance of the Jacuzzi to our vacation, and that he had an idea that he would like to go discuss with his management. To me, this was just like the days when I used to be a car salesman. In sales negotiations, I had told hundreds of customers to hold on for a few minutes while I went to talk to my manager. And in those talks with the manager, that's were the real decisions are made. So, I assumed that the concierge was going to come back to me later with a new offer of more than $250 in onboard credit. But it turns out that I'm the luckiest cruiser, ever. When the concierge returned, the situation took an unexpected turn! I've mentioned previously that there are four owner's suites on the Norwegian Sky. Well, it turns out that somebody that had booked one of the other owner's suites didn't end up making it onboard. I don't know if they missed their flight, or had a medical emergency, or what... for whatever reason, one of the other owner's suites was sitting empty, and it had a working Jacuzzi on the balcony! The concierge said that if we wanted to move, we were welcome to. That was the most unexpected, fantastic news that possibly could have come at that moment! Our luxurious cruise with our own Jacuzzi on the Norwegian Sky was about to rise from the dead! To fully understand the story, though, I have to bring you up to speed on one little detail to help you understand a little lie that the concierge told me to try to seal the deal. There are four owner's suites on the Norwegian Sky, and they are NOT all the same. 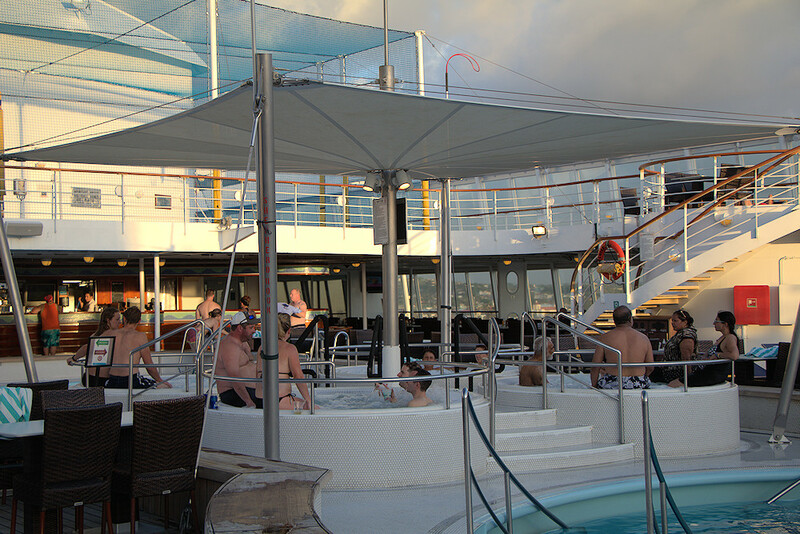 The two owner's suites on deck eight have larger balconies and larger Jacuzzis than the two on deck nine do. 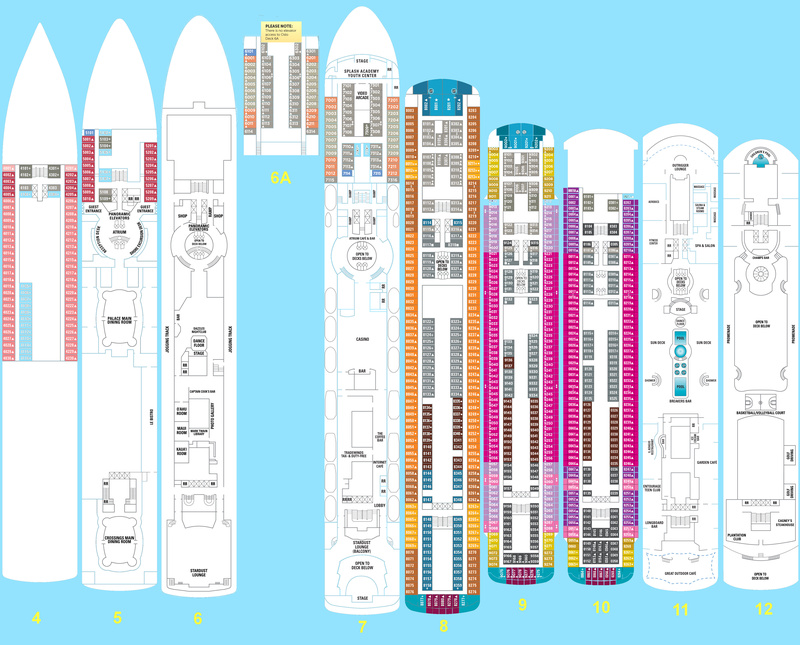 I knew this because of my pre-cruise research, and that is why when I booked the cruise, I booked cabin 8001. I wanted the larger balcony and the larger Jacuzzi... and there is no difference in price between the four suites. The concierge didn't know that I knew this, though, and to smooth everything over and get me to accept the change of cabins... which would be a win for them, since they would not have to give me the $250 onboard credit they had offered... he told me a little lie. He said that even though the move from suite 8001 to 9001 meant we would have a slightly smaller Jacuzzi, he assured us that 9001 was an even more expensive category of cabin than the one we had booked. In other words, he was trying to sell the deal to me as "an upgrade". This was an outright lie... but I was willing to overlook it, since I was so relieved to have found a way around the problem of the broken Jacuzzi. So, even though we had already unpacked all of our suitcases in to suite 8001, we quickly packed our suitcases back up... and handed them over to our butler, who took them to the elevator and moved them to suite 9001, one floor above us. And that's how we ended up in suite 9001 for this cruise, even though I had originally booked 8001 instead. And if you ever decide to book the owner's suite on the Norwegian Sky, be sure to book either 8001 or 8201... because those are the two with the bigger balconies and bigger Jacuzzis! One other small advantage of the two owner's suites on deck 8 is that the balconies offer a lot more shade. Because of the way the balconies sit mostly underneath the balconies of the suites on deck 9 above, you can sit in your Jacuzzi on deck 8 and not get sunburned. The interiors of all four suites are all the same, so definitely book 8001 or 8201... which is what I did, not knowing that I would end up in 9001 instead! Before we move on to other matters, I just want to show you this picture of the patio furniture on the balcony of suite 9001. 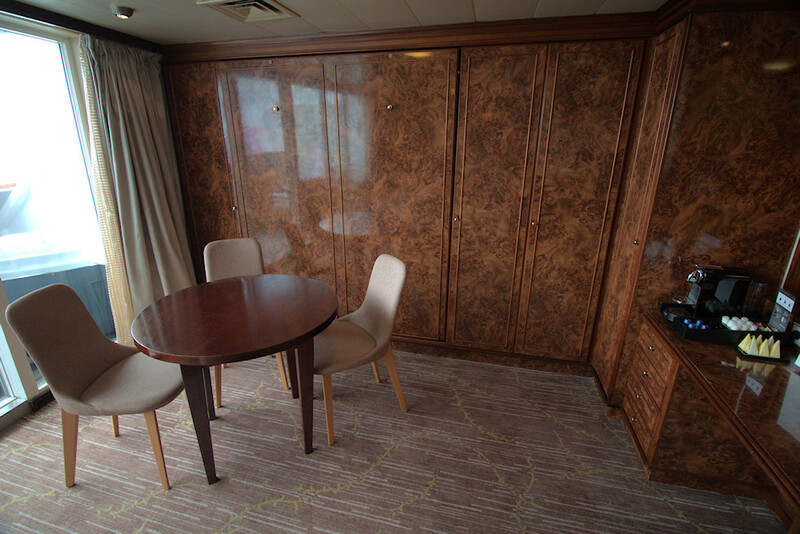 The suites on deck eight have the same furniture, there's just a lot more deck space, so it doesn't feel quite so cramped. 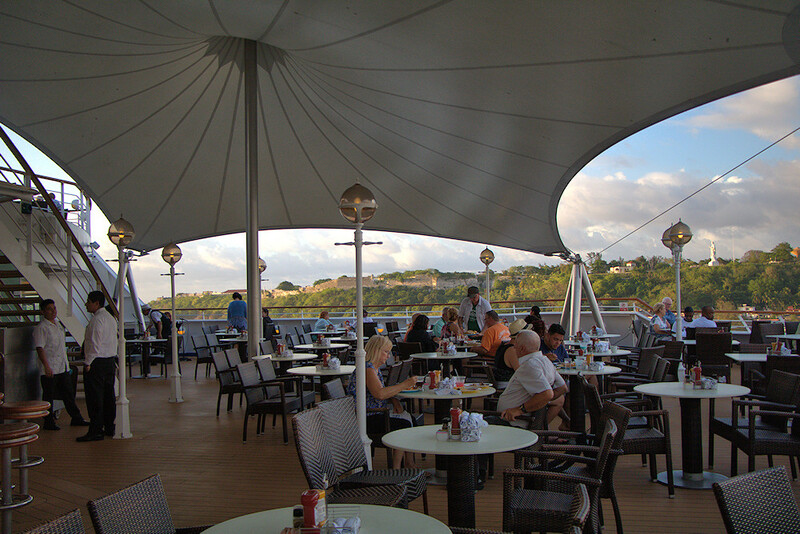 One other thing that jumps out at me in the photo is that NCL had outfitted the patio furniture with nice soft pads to make them comfortable. The week before our cruise on the Norwegian Sky, we cruised on Carnival Vista. Once again, we were in the most expensive cabin on the ship... but in Carnival's case, they didn't bother to put padding on the wicker lounger on the balcony. Carnival could learn some things from NCL when it comes to perks for the suite guests! Yes indeed... Norwegian Cruise Line is really good about pampering their suite guests. On their newer ships, suite guests stay within "The Haven"... a luxurious section of the ship that the rest of the passengers never see. Norwegian Sky was built back in the era before NCL came up with the concept of The Haven... but they still manage to spoil you! One of the ways they do that is to offer you a better dining option than the rest of the passengers get. 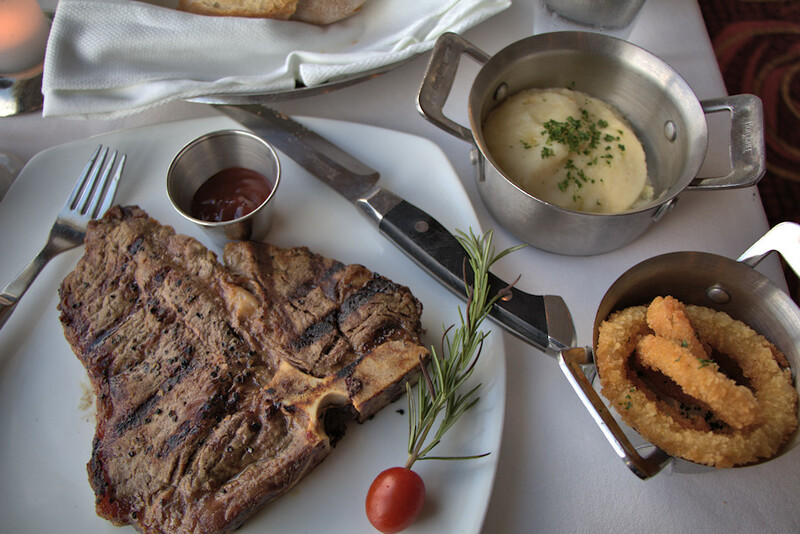 At breakfast and lunch time, suite guests are welcome to dine in Cagney's restaurant, which at dinner time is the ship's steakhouse. At breakfast and lunch, it's closed off to all the regular passengers, and offers an upgraded, pampered dining experience to the suite guests. And there aren't a whole lot of suites on the Norwegian Sky, so you're dining among a fairly small group of passengers. If I remember right, I think there are only around 12 suites on the entire ship... so you're eating in a restaurant which, at its absolute busiest, only serves about 25 guests. Since the meals are served during a two hour window, it's never busy in Cagneys and they really spoil you. It was really great to have the full attention of the staff at Cagneys. They really made us feel special, yet allowed us to be casual and comfortable. You did not have to dress up, or anything like that. I didn't take any photos of our breakfast or lunch experiences in Cagneys... I guess I was too busy enjoying it! It was one of the highlights of the cruise. I liked the menu, and they were eager to please. Just as an example... at breakfast they offer croissants, but they are served at room temperature. I asked the waitress if it might be possible to have the chef warm up a couple of croissants for me. They were happy to do so, and every morning for the rest of the cruise they brought me three warmed-up croissants as soon as I sat down for breakfast. I know you're probably thinking that since we stayed in the owner's suite, we must be stuck up, high-maintenance, caviar-eating snobs... but that couldn't be much farther from the truth! At my "real job", I'm the mailroom guy. The owner's suite is only possible because of the success I've had over the last few years on YouTube. Really, Kellyn and I are very casual and simple. On most cruises, we eat every meal in the buffet! And even on this cruise, staying in the owner's suite, we managed to have a couple of meals in the buffet. I consider myself a bit of an expert when it comes to cruise ship buffets. 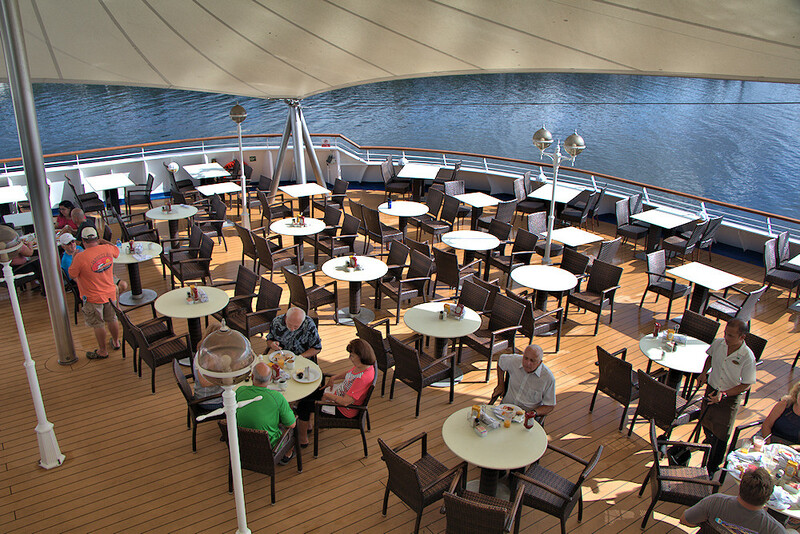 Over 42 cruises, we've shunned the main dining rooms most of the time and have had most of our meals in the buffet. So, I know a good one when I run across one. What I've learned after all those cruises is that there are three main issues that determine whether I'm going to like the buffet or not: the amount of variety in the foods they offer, the overall quality of what they serve, and whether the restaurant targets the tastes of American passengers or shoots for an international mix. The variety thing is just a matter of how many different food choices there are at the buffet. Are there four different entrees to choose from, or are there 20? Is there one kind of potato, or are there five kinds to choose from? Are there five different desserts, or 20? I'm a little bit of a picky eater, so I really like it when a buffet offers a huge number of food items to choose from. I may not like 80% of what they offer, but if they offer 20 different entrees... that still gives me lots of options. What I've come to realize after 42 cruises is that the more passengers a buffet has to serve, the greater the variety they tend to offer. So, small cruise ships typically offer less variety in their buffets... and large cruise ships tend to offer much more variety. The Norwegian Sky is fairly small cruise ship by today's standards, so the buffet doesn't offer the kind of variety I've seen on some of the mega-ships we've been on. When I think of sheer variety of items in the buffet, I think of Royal Caribbean and Princess. As far as quality of the food, I can't say I've ever really been all that disappointed in a cruise ship buffet. It's usually good. Some try a little harder than others, though. 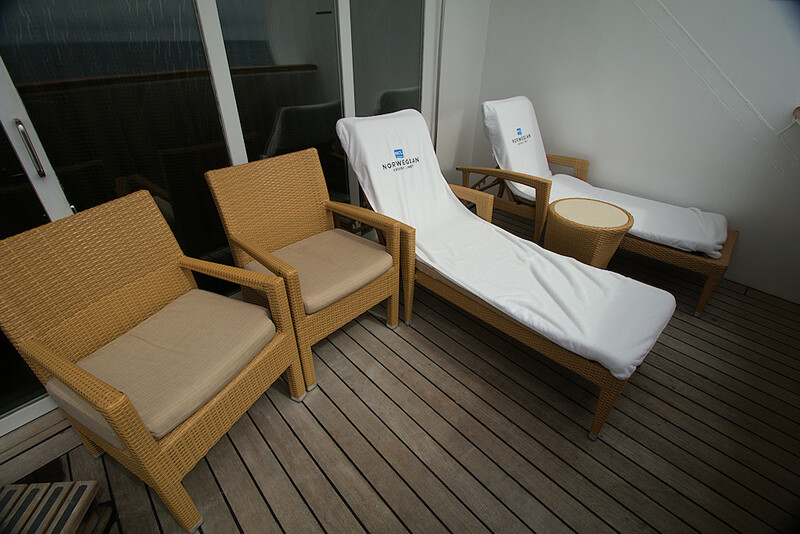 Of the 42 cruises we've been on, Viking Ocean Cruises was a standout in this regard. What disappointed me the most about the buffet food on the Norwegian Sky was that a lot of it seemed targeted to an international demographic. OK, sure, I get it. It wasn't all Americans on this cruise... and they all want to eat. But from my perspective, as a somewhat picky American eater, the food they offered in the Norwegian Sky's buffet just didn't seem targeted to me that much. 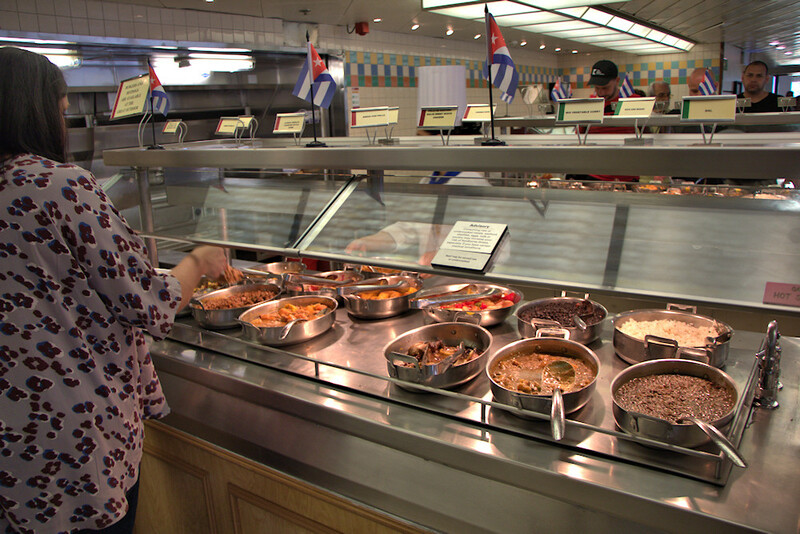 When I think of the cruise line that offered some great American-style food choices in their buffet, I think of Princess. Notice how all the tables in the sun are empty, and all the passengers eating meals are doing so at shady tables. On a warm day in the Caribbean, it's all about finding shade! 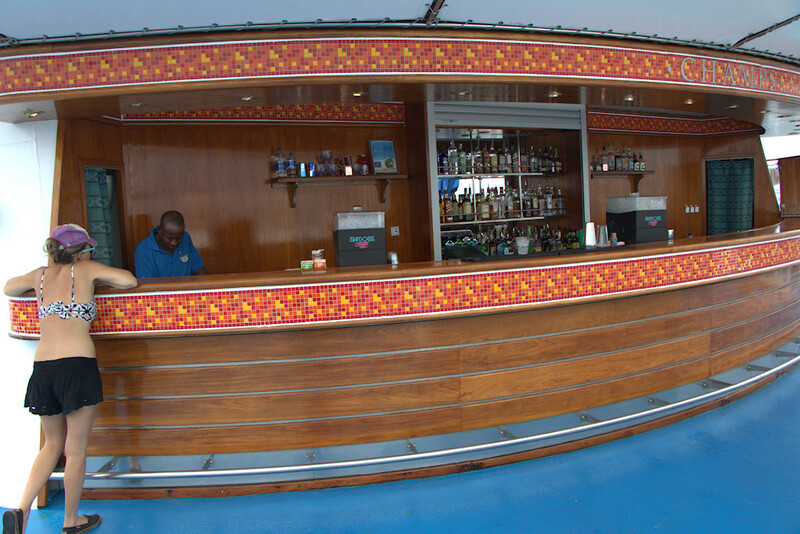 The Norwegian Sky is one of the few cruise ships in the world to offer an open bar. 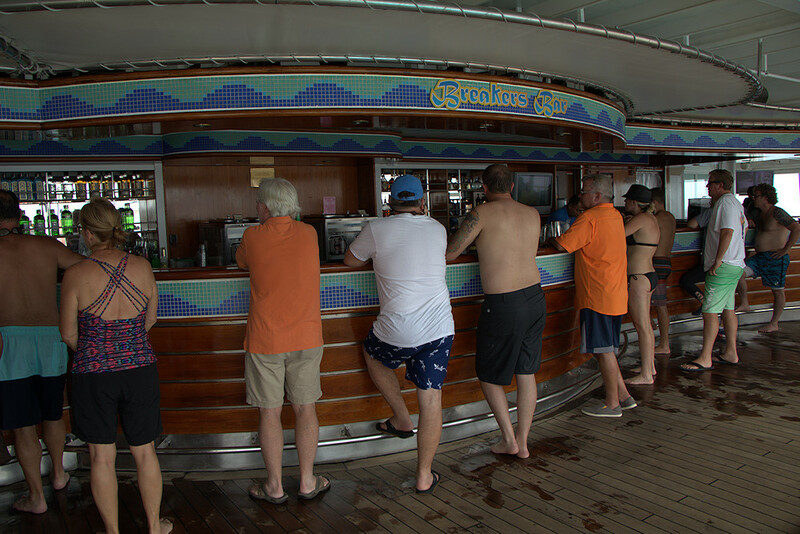 What that means is that every passenger on the ship, even the ones staying in the least expensive cabins, can walk up to any bar on the ship and order any drink they want... at no additional charge. You don't have to show a card, or sign for anything... just order a drink, they'll make it for you, and it's yours. You can even order two drinks. This is not just during happy hour, not just during meal times, not limited to one particular bar... it's any bar, any drink, whatever they've got, any time the bar is open. Have a drink, if you want one. Try something you might not try if you were paying for it. 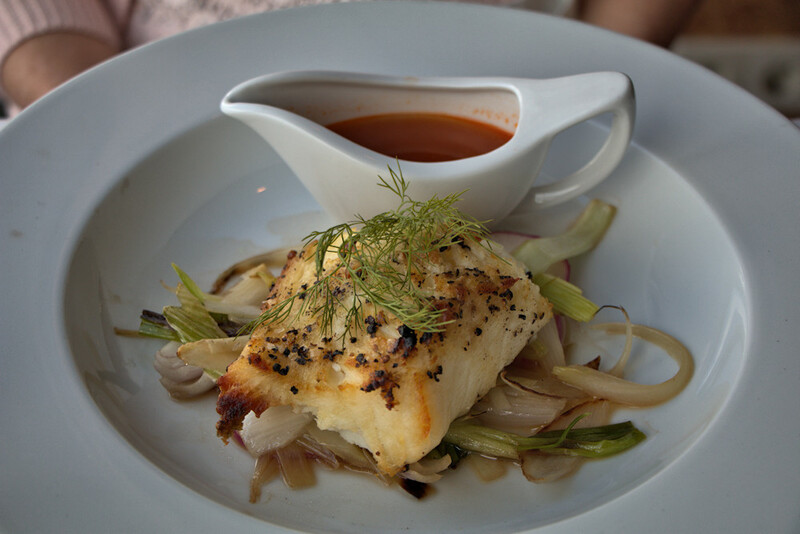 If you don't like it, toss it out and order something else. It's a really different experience compared to how it works on most other cruise ships where the cruise line's strategy is to try to make huge amounts of profits by charging big money for drinks. I have to say that whoever thought of this at NCL headquarters is an absolute genius! Here they have an older ship that simply would not be able to compete against all the amazing new cruise ships out there. But by instituting the open bar policy, they all of a sudden have a ship that offers something vacationers love, at a very affordable price. I admire the brilliance of this simple idea... and I'm glad that NCL seems to be able to make it work financially. It's the difference between having their second-oldest ship sail full or not. And it will make a lot of people want to cruise on the Norwegian Sky again... especially if this is their first cruise and for their second one they go on Royal Caribbean or Carnival or any of the other cruise lines that charge an arm and a leg for a drink. I do have to say that even at the bars that were busy, the line moved quickly... because they had quite a few bartenders, and also because they don't have to create a bill and take your payment after they make your drink. Three photos ago, in the photo of all those bottles of liquor, there's a funny story. 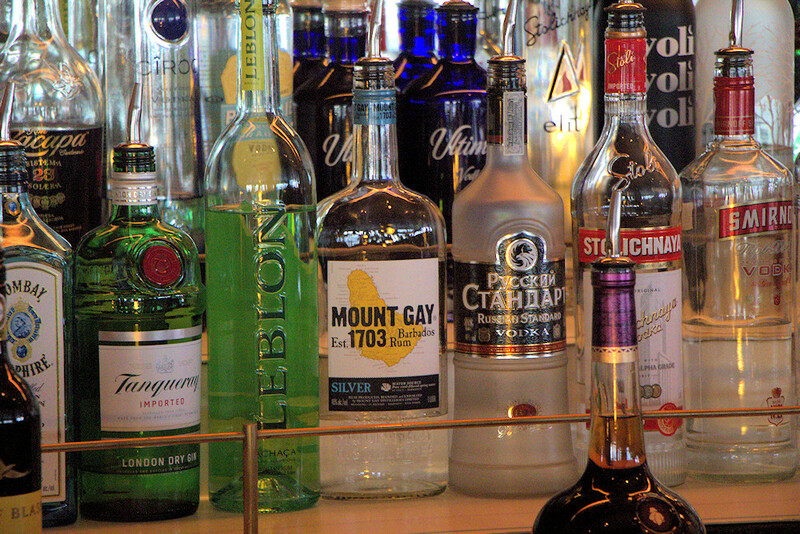 There's a bottle in the center of the photo with a label that says "Mount Gay - Barbados Rum". You think I'm about to make some witty (or tacky) comment about a rum named after a slang word for homosexual. Nope. I've actually been to Barbados, and I know that the tallest mountain on the island is called Mount Gay... and that they named their local rum after the mountain. That's not the funny part. What's funny to me about it is something that happened to me one time when I was on a cruise that visited Barbados. We were on an all-inclusive sailing excursion off the coast of Barbados. When I say all-inclusive, I mean that the sailboat had an open bar. So, you could just walk up to the bar and order a drink, and they would make it for you at no additional charge. The only restriction was that it was a small boat, a small bar, and they had a limited selection of liquor with them. I'm a rum-and-coke guy... and Malibu rum is my rum of choice. It's a coconut rum, and that coconut flavor mixes perfectly with Coke, Diet Coke, Pepsi, etc. By the way, one of these days, some genius at a cola company is going to figure out that coconut flavor and cola are a match made in heaven... and they'll offer coconut flavored cola. Coconut Coke even has a nice ring to it, don't you think? As of yet, though, I don't think anybody offers such a product. So, Malibu Rum and Diet Coke works for me. So there I was, on a sailboat, off the coast of Barbados, and they had an open bar with a limited number of liquors to choose from. Luckily, they did have Malibu rum, and they did have Diet Coke. So, I was happy. I ordered one. The bartender was a bit of a character, though... and had no qualms in letting me know that he thought their local rum, Mount Gay Rum, was better than Malibu rum. The way he said it still makes me laugh when I think about it! When I ordered the Malibu and Coke, his response was to shake his head in disapproval and say "Aw, that's a girlie drink! Let me make you one with our local rum instead!" So, that's how I ended up trying Mount Gay Rum one day... only to discover that it's absolute crap, at least when mixed with Diet Coke. I'll stick with Malibu Rum from now on, thanks! 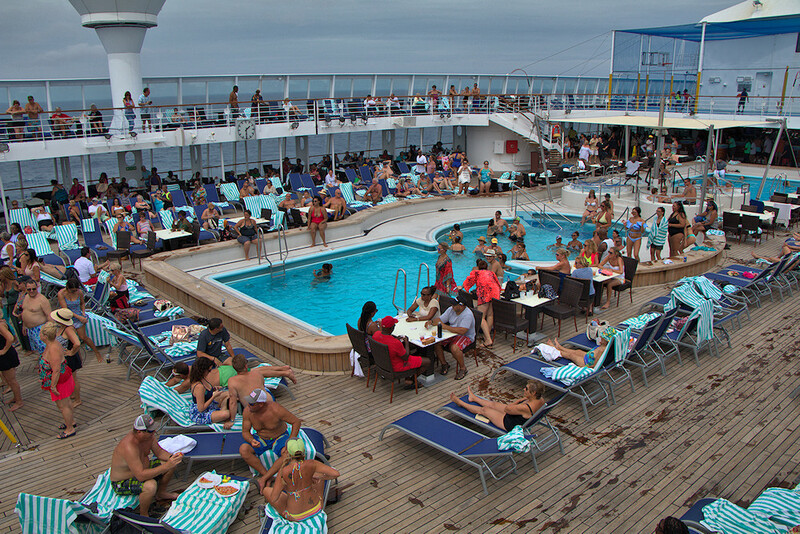 In the first photo, taken after our ship had docked in Havana, the pool wasn't very crowded... because a lot of people were heading ashore. 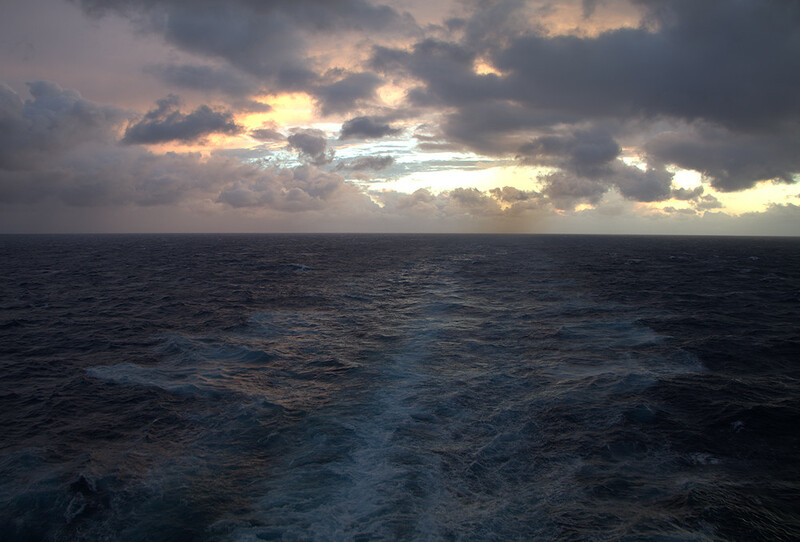 The next photo shows what it was like when the ship was at sea and the weather was warm. One thing I really admired about the design of this area is that they had clustered four Jacuzzis together and put them under a big umbrella/tent thingie to provide some shade. This helps to prevent sunburned shoulders while you're in the Jacuzzi. The Norwegian Sky is the second-oldest ship in Norwegian Cruise Line's fleet, constructed in 1999... so it is literally a ship of the previous century. Yet, it's still got a few things going for it! I've already mentioned the brilliant move that NCL made in having an "open bar" policy on Norwegian Sky. That makes this ship very attractive to a lot of people looking for a short booze cruise. The four owner's suites are another great reason to choose Norwegian Sky for your vacation. If you want a super-comfortable cruise experience with a lot of pampering, and your own private Jacuzzi... you can't beat the owner's suites on Norwegian Sky without paying a heck of a lot more to be in a high-end suite on a newer ship. First, I have a confession to make. I had no interest in visiting Havana! There, I said it. 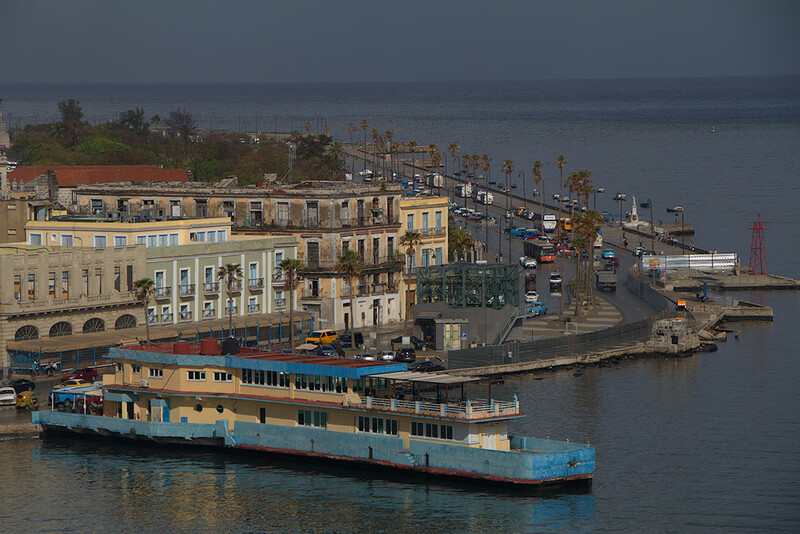 When I booked this cruise, Havana wasn't even on the itinerary. They changed it after I had already booked what I thought was just going to be a Bahamas booze cruise. So, if you're looking for a review that goes in to great detail about Cuba, and the people, and all the things to do there... this is going to be very disappointing to you! I'll share a few photos, but you have to understand that we spent the absolute minimum time ashore as possible. 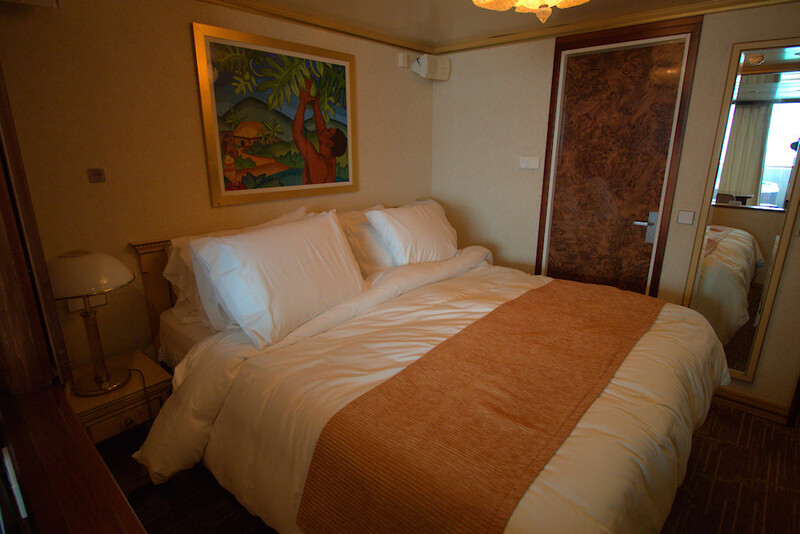 The ship was there for two days, but we mainly stayed aboard to enjoy the comforts of the owner's suite. That's what this cruise was all about for us... not Havana. I shot a time-lapse video of our ship sailing away from Havana. One of the few things I had heard about Havana was that they have a lot of old classic American cars that have been restored. Yes, they do... but that's not to say that those are the majority of the cars you see there. There are far more newer, modern cars there than the old classics. They just don't have modern American cars. It's mainly Japanese and European compact cars, as you can see in this next photo. The classic restored American cars are mainly just in search of tourists to hire them for tours. 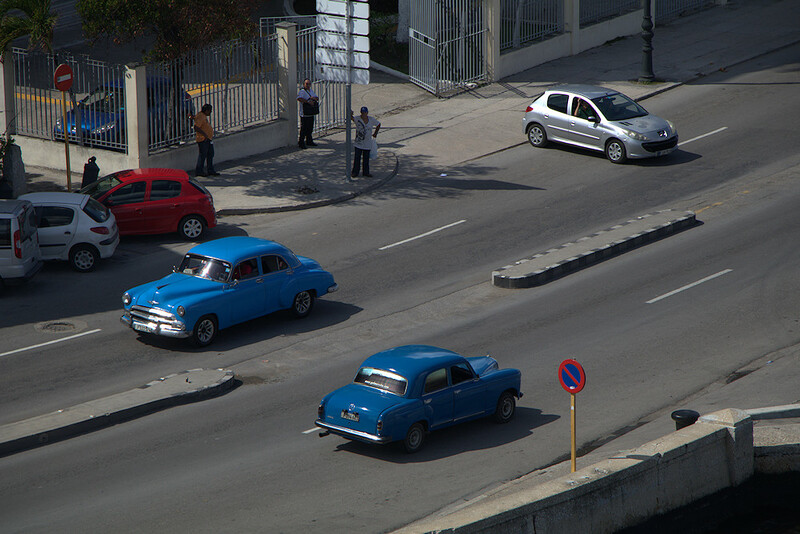 The real people of Havana seem to prefer low-budget compact cars, which were in abundance. 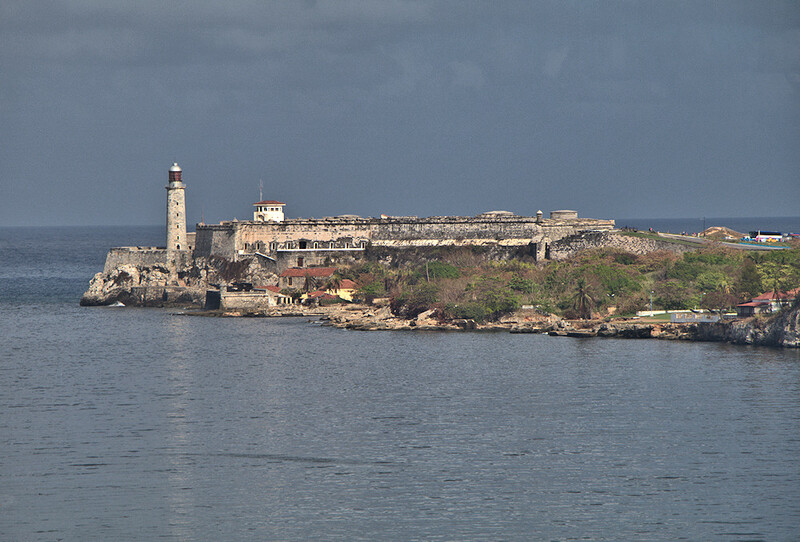 I mentioned that we "mainly" stayed aboard the ship in Havana. I knew that if we took a cruise to Cuba and never stepped off the ship, that I would have been teased unmercifully by my co-workers back home. So, we booked the shortest, most innocuous shore excursion that was offered: a short visit to a big hotel to watch a big stage show. I have a map of the Caribbean on the wall of my office at work. This would allow me to stick a pin in Cuba and truthfully say that I had been there. But really, I could not have cared less! My wife was even less enthusiastic. She was somehow under the impression that Cuba was a dangerous place, and she was quite scared to get off the ship... and only agreed to this excursion after much coaxing and reassurance on my part. She had nothing to worry about, though. We've been to far sketchier places! 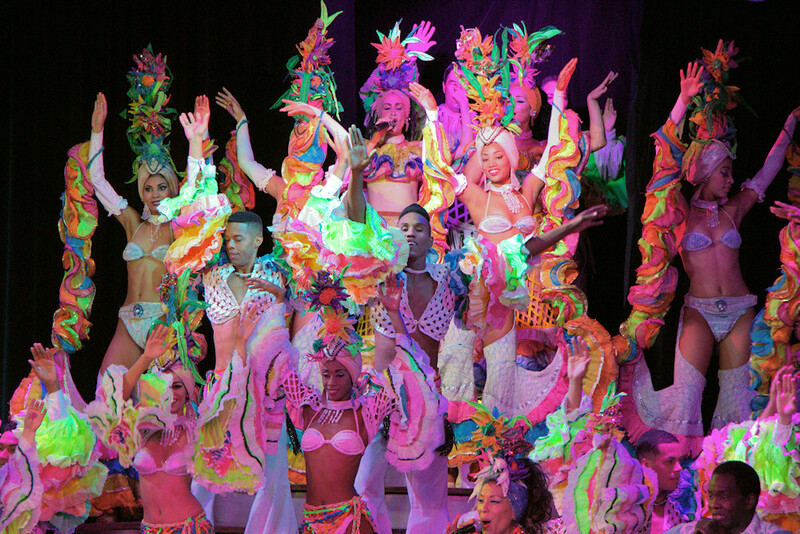 The venue was the Hotel Nacional De Cuba and the show was called the Parisien Cabaret. From the ship, there was about a twenty minute bus ride to get there and back. The show was almost entirely in Spanish, so I didn't really understand any of the lyrics to the songs or what was being said. Honestly, the show was a waste of my time... and the only real bright spot of the whole thing was chatting with a delightful young couple from our ship that were seated at our table. They were a joy to talk to before the show. I think my wife was wrong about any real dangers in Cuba... the people seemed happy to have us there and I never sensed anything to be afraid of. Cuba has been open to Canadian tourists and other international tourists for a long time... so it wasn't like visiting North Korea or anything like that. The one thing that really surprised me about Cuba was how dirty and smelly the air was there! There's an oil refinery alongside the bay, and the wind blew the fumes and the pollution right at the downtown area. It smelled horrible. Plus, a country like that probably has zero pollution control laws... so all the cars and the diesel engines just add to the problem. I could name 30 other places in the Caribbean that are better choices for a relaxing vacation. 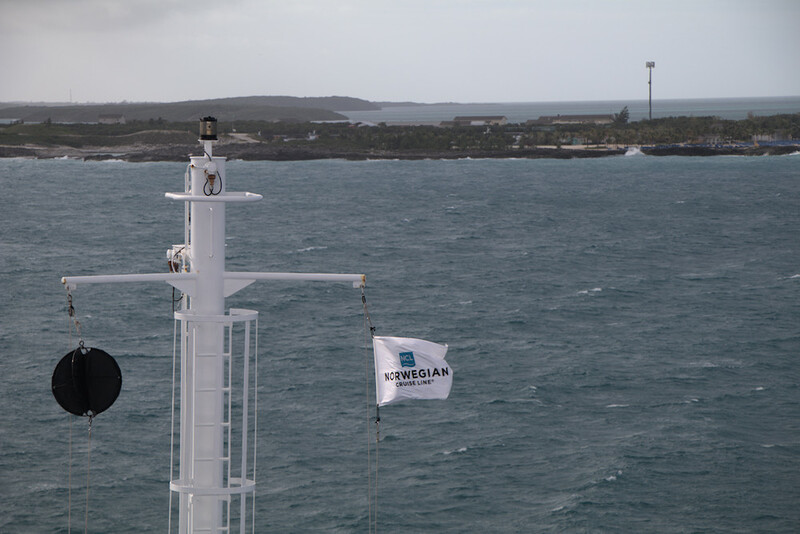 Our other scheduled destination on this 4-day cruise was NCL's private island on Great Stirrup Cay in the Bahamas. I was looking forward to spending some time at a beautiful beach with nice warm water! However, it was extremely windy when the ship arrived at the island, which created some big ocean swells. It simply would not have been safe for the ship to operate tenders to get guests ashore in those conditions. The ship anchored off of the island for a while... and a tender came out from shore... but it was clear in watching that tender bob up and down in those swells that there was no way they were going to be able to get the passengers ashore in those weather conditions. The Captain came on the public address system and explained that we would not be able to go ashore, and we ended up having a fun day onboard the ship instead. At the end of the cruise, the ship returned to the port of Miami and it was time to go home! During this particular vacation, we had actually done two cruises... not just this 4-day cruise on the Norwegian Sky, but the previous week we had done an 8-day Southern Caribbean cruise on the Carnival Vista. You can read about that cruise here. We had made arrangements with our butler to meet us at our suite at 8 AM to help us disembark. He was only allowed to take us as far as the gangway, as he had no special powers to speed us through U.S. customs after that! But he was able to help us skip a bit of the line of disembarking passengers in the atrium area of the ship. It was our final bit of privilege for being a suite guest. There's been a nice change recently regarding going through US customs after a cruise. It is no longer necessary to fill out a US customs form unless you have exceeded the spending limits. I don't know if that's just something they're trying out in Miami, or if it's true at all U.S. cruise ports now... but it does slightly simplify the process of disembarking from a cruise ship. To get from the cruise ship port to the airport, we have become true fans of the ride sharing service, Lyft. In many of my previous cruises, a taxi was my normal transportation choice. But times have changed and I have really come to appreciate the benefits of using Lyft and Uber. It's significantly cheaper than a taxi, and you don't have to fumble with cash at the end of the ride. All the billing happens automatically. Also, you don't have any shenanigans from a taxi driver trying to trick you in to paying more than was actually due, as happened to us once in New Orleans. The billing is simple and straightforward. I know all the younger travelers have long ago embraced Uber and Lyft... I'd just like to address any senior travelers who may be reluctant to try something new and high-tech: you really ought to give it a try. You'll save some money, and eliminate a few common taxi problems. I shot a video of our takeoff from Miami international airport. At about two minutes in to the video, you can see 4 cruise ships at the Port Of Miami. We had nice first-class seats for the trip home to California. 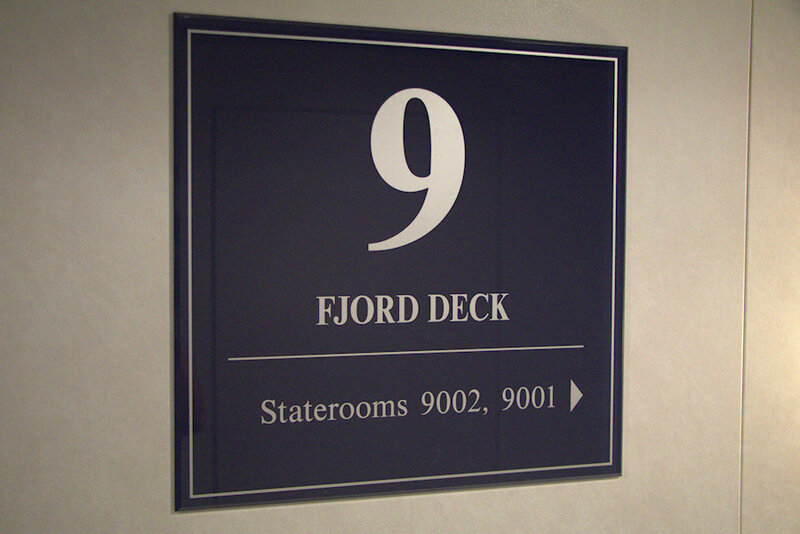 Our suite was on deck nine... and, as you can see from the sign, deck nine is known as the Fjord deck. Every time I walked past this sign on the way to our cabin, I made a joke in my head about how they should have named deck eight the Tjoyota deck, and deck seven the Hjonda deck!